“Smart cities” are a new mode of urban governance and management “where digital technologies would play a preponderant role in improving relationships and flows in a given area1”. They are part of the process implemented by local authorities concerned about improving their public service performance in times of economic crisis . The local implementation of technologies enabling better management and collection of data in an improved participative system is considered a major market, able to reconcile quality of life for people and companies, environmental protection, and economic growth2. 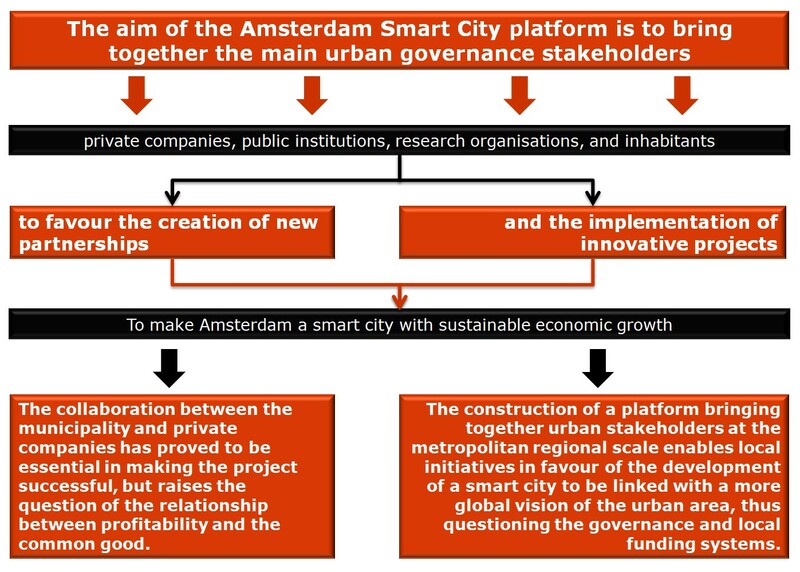 The aim of the Amsterdam Smart City platform is to create new projects and partnerships among the various urban governance stakeholders, with the ultimate goal of making Amsterdam a “smart city”. For many years, the city of Amsterdam has positioned itself as a major player in the fight against global warming and the implementation of innovative projects in favour of sustainable economic development3. The “Amsterdam Smart City” platform came into being in that spirit. Initiated in 2009 by the Amsterdam Economic Board4 and the electricity operator Liander, in close collaboration with the municipality, the initiative aims to implement pilot projects in the Amsterdam metropolitan area and to create new partnerships among private companies, public institutions, research organisations, and inhabitants. 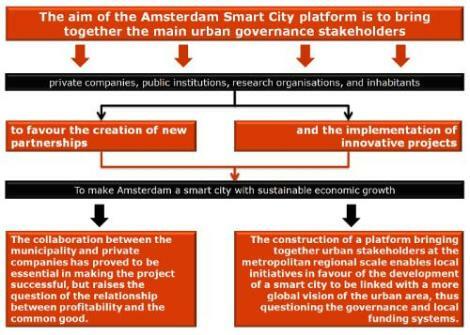 In other words, Amsterdam Smart City is a cooperation platform that seeks to connect different types of urban development stakeholders in order to develop the Amsterdam metropolitan area as a “smart city”. Operating as a project incubator, the platform enables a broad variety of initiatives to be tested, and the results to be shared. The city is conceived to be a laboratory of innovation, where new funding methods, technologies, and cooperative action will assist the implementation of a more efficient urban area, and a major change of mindset. Organised around 5 Themes5 and 3 Areas6, the aim of the initiative is to help implement sustainable economic development of the urban area, prioritising the effective and appropriate use of available natural resources7. One of Amsterdam Smart City’s principal success factors is the political backing of the City of Amsterdam and its association with major private partners. These associations were crucial in attracting partners, mobilising funds, and initiating the implementation of projects. The city thus gambled on private funding sources, positioning itself as a partner rather than as the main funder. The first phase of the project (20092011), with a budget of €4 million, was thus 20% financed by public funds from the municipality, 40% by the principal private partners, and 40% by European funds (ERDF). In the longer term, the municipality is seeking to develop private funding lines to depart from a model based on public grants, while continuing as guarantor of the area’s public interest. Nonetheless, each project has its own particular funding system, which varies according to the partners involved and investment needs. Most of the larger projects have been funded through public-private partnerships (PPPs), whereas some projects requiring less initial capital were directly financed by SMEs. Amsterdam Smart City has enabled numerous projects to be established, from the moment it was launched. However, given the variety of initiatives, and the differences in scale and timeframe required to implement them, it remains very difficult to assess their impact reliably, especially in the long term. The platform has nevertheless proved its efficacy and relevancy because the number of partners and projects has continually increased (43 projects implemented in 4 years). Amsterdam Smart City therefore seems to have succeeded in becoming a space for meeting and collaborating, and a source of inspiration for urban development stakeholders, establishing a new governance system for the city and having a positive impact on the area (800 jobs created in 3 years). The platform has also contributed to enhancing the city’s reputation8 and influence, as a centre of technical innovation that enables sustainable growth, and therefore attracts new investors. Finally, the platform provides a particularly appropriate scale of experimentation, making it possible to identify new practices and promising initiatives that could be implemented on a larger scale or in other contexts. In the long run, these projects will thus be potential vectors of a better quality of public services and the streamlining of local government spending. Nevertheless, the platform has some major challenges to confront, in particular its governance system and the need to include certain stakeholders, such as citizens and SMEs, which are largely absent from the decision-making and project-implementation processes. Adjustments are therefore necessary to enable users and small companies to become real stakeholders in the sustainable and smart city, above and beyond their status as consumers of urban services. Finally, the funding of numerous urban infrastructures by private investors arouses debate, in that their growing place in building the city calls into question the relationship among profitability, public interest and the common good, as well as the role of the municipality in fine-tuning the various objectives. 1 A. Picon (2013), Théorie et critique d’un idéal auto-réalisateur, Collection Actualités (in French). 3 In 2008, the city established the “New Amsterdam Climate”, providing a framework to help the transition to a low-carbon city and fixing an objective of a 40% reduction in C02 emissions by 2025 compared with 1990. 4 An institution that brings together government agencies, research institutes and private companies, charged with reinforcing the economic position of the Amsterdam metropolitan area. 5 Living, Working, Mobility, Public facilities and Open Data. 6 Three neighbourhoods of Amsterdam, relatively different in terms of population, economic activity, and history: Nieuw West, Zuidoost, and Ijburg. 7 On the same subject, an especially useful tool, ecoBUDGET, has been implemented in the cities of Växjö in Sweden and Tubigon in the Philippines. This instrument can enhance the value the environmental capital of a city or region by integrating its contribution to collective well-being into its budget. For further information, consult the “Ecobudget”. 8 For example, in 2011 Amsterdam won the European City Star Award for its efforts in favour of energy transition and sustainable development, including the Amsterdam Smart City initiative. The city is also ranked fifth in Siemens’ Green City Index.